Sift through the lentils quickly to make sure there are no tiny stones or other debris. Combine moong and masur lentils in a large bowl. Wash lentils with cold water and drain; repeat 1 or 2 times. Place lentils, water, salt and turmeric in a large pot with a tight-fitting lid and stir. On medium to high heat, bring lentils to a boil, then stir and cover most of the pot with the lid. Leave a 1-inch slit through which steam can escape; otherwise, the lentils will foam over. Reduce the heat to low and cook for another 5 to 8 minutes, or until there is very little foam left in the lentils. Cover the pan fully with the lid and cook lentils for another 30 minutes, or until tender and velvety looking. While lentils are cooking, make the masala. In a shallow frying pan, heat ghee on medium-high heat for 45 seconds, or until completely melted. Add asafetida and allow it to sizzle for 15 seconds, then add cumin seeds and allow them to sizzle for 15 seconds. Reduce the heat to medium. Stir in onions and sauté until brown, 8 to 10 minutes. Add ginger, tomatoes and cayenne (or jalapeno pepper) and sauté, stirring regularly, for 5 minutes or until the oil glisten on top. Pour masala into the pot with the hot cooked lentils and stir well. (Be sure to get all of the masala from the frying pan.) Just before serving, stir in cilantro. Ladle piping hot curry into individual bowls and serve immediately. Mmmmmm.....delicious and healthy. I really love this curry with paratha. 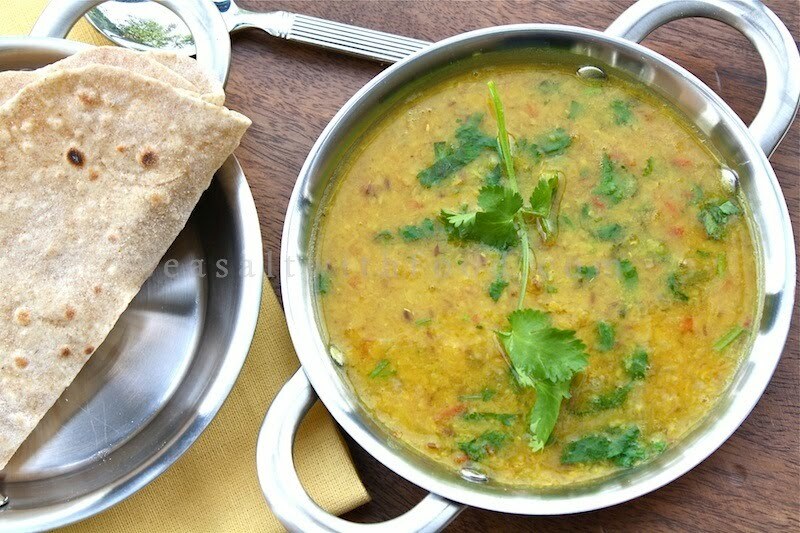 Dhal is a favourite of mine too, my friend Meena's mum taught me how to make it, along with chapatis. Mmmm, this is one of my favourite curry with roti pratha/canai for breakfast! Added you link to my blogroll. Cheers! I just made this the other night...and it was probablly the most authentic Indian food I have ever made....One question...did you use whole or split lentils for this? Again, thanks for this post...It was absolutely delish!!! 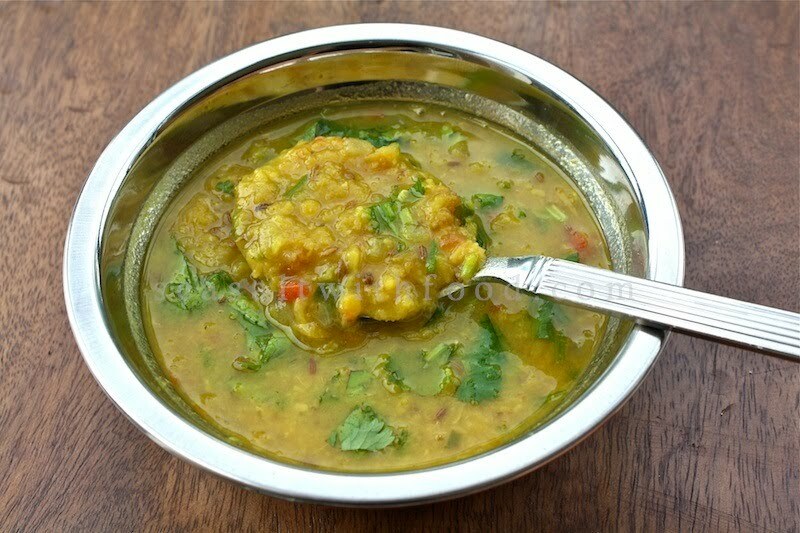 I'm always looking for dhal recipes - thanks for posting! I'll have to try this soon. Get thyself to an Indian grocery! Problem solved! I mix moong and moosur dal all the time! It's one of our most favoritist dals. 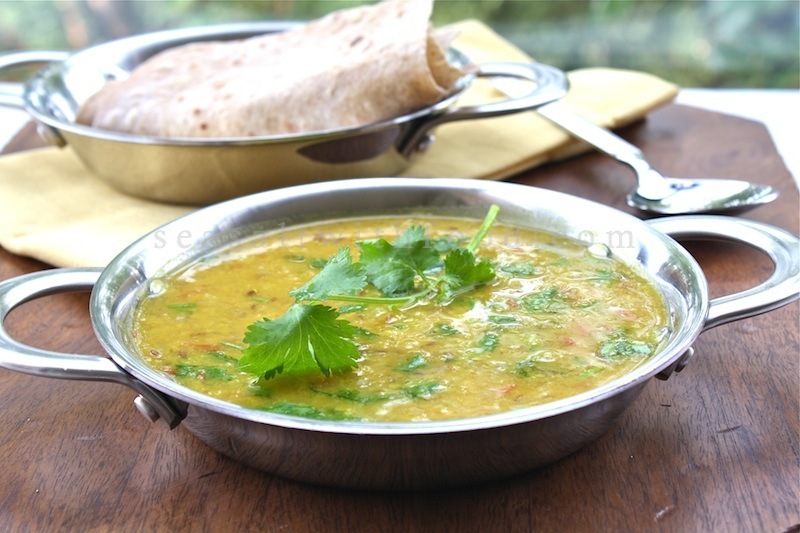 I also use this combo of ingredients with just moosur dal too. Lovely and very scrummy with parathas!